Photograph from the Curzon Collection: 'Vist of His Excellency the Viceroy. Kotah, November, 1902' of the drawing room in the Umaid Bhawan or New Palace at Kota in Rajasthan, taken by P.A. Herzog and P. Higgins in 1902. The palace was built for Maharaja Umed Singh II (ruled 1889-1940) as a modern alternative to the 17th-century fortified City Palace. It was designed by Samuel Swinton Jacob (1841-1917) in the so-called "Indo-Saracenic" style. He was a leading exponent of this Orientalist style, which fused European and Indo-Islamic architectural forms with an emphasis on arches and domes. Although the exterior is embellished with Rajput and Mughal details, the overall composition of the palace including much of the interior is European in conception. 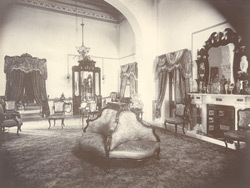 This is a view of the drawing room, decorated and furnished in an Edwardian style.